How do louvers work and what makes them so effective? Do you know what louvers are? They are certainly elements that you’ve seen in architecture but may not have a name for. They are those angled slats or flat strips that you see near the corners of wrapped around buildings and homes. They allow airflow while ensuring that other elements like water, dirt, and debris stay outside. Now that you know what louvers are, let’s talk about how they work. There’s a lot of math that goes into designing a louver system. The free area takes the total open area and divides it by the wall opening. In that calculation, the obstructions including the blades and frame are subtracted. Usually, the free area takes up about 35 to 60 percent of the wall opening. The higher the percentage, the more air is able to enter which ultimately reduces the cost of the louver. When louvers are properly designed, they allow minimal water to enter. There is a point in the louver’s design where water penetration is allowed to flow through. It uses a measurement that calculates the air intake velocity when the louver will start to leak. With traditional louvers, water penetration is tested by allowing air to flow through the louver as a measured amount of water is added to the airstream. At that point, the velocity of the air is slowly increased until water enters. 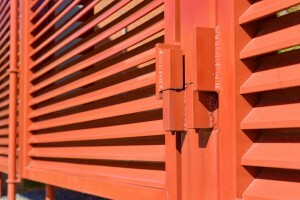 With wind-driven rain louvers, wind is applied to measure water penetration. These tests ultimately are conducted to measure how effective the louver is at stopping water from passing through the louver. A different test is conducted to measure the amount of airflow resistance caused by obstructions like ductwork, filters, coils, and other building structures. Professionals run air through the louver to be measured at various velocities. The amount of air resistance depends on a lot of factors, including the shape and angle of the blades. The results of this test allow professionals to determine if the pressure loss of the louver is acceptable. Effective louvers require a lot of calculations. They are based on principles of the free area and water penetration. To allow as much air through the louver as possible with minimal water penetration, professionals calculate various percentages related to velocity, volume, and resistance. These percentages are then placed into tables and studied. This entry was posted on Friday, December 1st, 2017	at 11:19 am	. You can follow any responses to this entry through the RSS 2.0 feed. Both comments and pings are currently closed.